The economic policies of Jeremy Corbyn have come under widespread criticism. This exceeds the level of scrutiny of his policies; many of his critics do not seem to have troubled themselves to read his key policy document. It also by far exceeds the level of scrutiny devoted to any of his leadership rivals. This is not surprising. All major sections of big business in Britain and in the western economies as a whole are committed to austerity policies. The economic consensus in favour of austerity arises not from economics textbooks or any appraisal of economic history – even recent history such as the stagnation from 2010 to 2012, and the rise in the deficit that resulted. Austerity is the consensus because it represents the interests of those dominant sections of the economy and therefore society. This explains the assault on Corbynomics, which we should expect to intensify if he wins the leadership of the Labour Party. It is noteworthy that the critique begins with capital flows and rests on the absolute power of financial markets to set exchange rates and interest rates. These are real and powerful forces and cannot be ignored. But the dominance of finance capital in British society is so great, it influences opinion so that the argument ‘There Is No Alternative’ appears to have great weight. The weight of this argument would be lesser in countries such as Germany, or Sweden, or even the US. There is no denying the British economy is increasingly dependent on inflows of overseas capital, setting new lows last year. This is not simply or even primarily the chronic UK trade deficit, which has persistently oscillated around 2% of GDP in recent years. 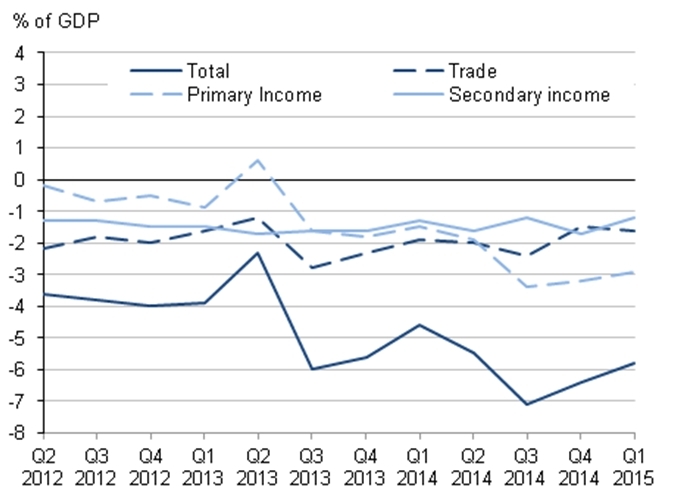 As Fig.1 below shows it is the sharp deterioration in the primary income account which has caused a sharp and unsustainable rise in the current account deficit. It has swung from small surplus in mid-2013 to a deficit of 3% or more of GDP in recent quarters. The primary income account and its components is shown in Fig.2 below. There are two key points to be highlighted. The first is the very large and persistent deficit on portfolio investment, ranging between 5% and 10% of GDP. This is a net outflow of capital representing the far greater propensity of British capital to invest overseas because of higher returns. But this persistence means that portfolio investment outflows are not responsible for the recent sharp deterioration in the primary investment account, and therefore in the current account as a whole. The balance of Direct Investment has swung from a surplus to a deficit and accounts for the deterioration in the external accounts. This has taken place while corporate taxes have been cut and while the last government was claiming that ‘Britain was open for business’. It is a remarkable fact that the government’s repeated assertions that its policies are promoting growth and investment are rarely challenged although they are so clearly false. George Osborne has repeatedly asserted that his policies are successfully promoting investment. Specifically, he and his supporters have argued that the cut in Corporate Tax rates from 28% to 18% is and will promote Foreign Direct Investment. Fig.3 below shows that FDI inflows have been declining over the medium-term, even while corporate taxes have been cut and ‘business-friendly’ policies have been adopted. It is no accident that the sharp deterioration in the external accounts occurred in mid-2013. As SEB has shown elsewhere the Coalition government halted new austerity measures and even slightly increased government spending in order to get re-elected. Borrowing, particularly for housing and other consumption was encouraged. Unless government borrowing was to increase, or were to companies face higher taxes, then the increase in borrowing had to be sourced from overseas. In order to get re-elected the government encouraged an unsustainable borrowing binge. It now proposes to deal with this crisis with renewed austerity, which will cause an economic crisis. Overseas investors have a diminishing appetite for investment in Britain because it is a slow-growth, low-investment economy. 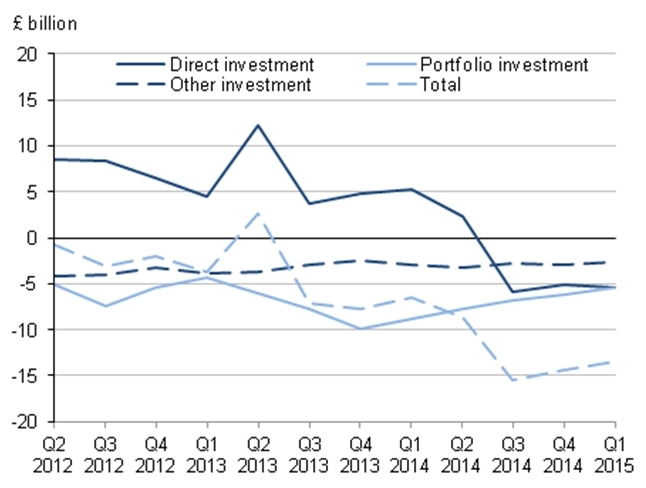 Low British investment levels become self-reinforcing. The entire criticism of Corbynomics can be shown to be a case of what Freudian psychoanalysts term projection. It is the current policy which has dramatically increased the dependence of the British economy on overseas capital inflows. And the only remedy offered is renewed austerity. This is simply ‘TINA’ (there is no alternative) purportedly from the perspective of the all-powerful dealing room floors of the City. One of the weakest points of the critique is that it rests on the outlandish proposition that the Bank of England retains credibility. The independent Bank has presided over the biggest ever financial crash in Britain and the longest recession. Throughout most of 2008, the MPC was discussing the need to raise interest rates, even as the economy had already begun its biggest slump since the 1930s. The Bank’s record on growth since independence has been markedly worse than the rest of the post-WWII period. It has also persistently missed its own inflation target. It has a spectacularly bad forecasting record for growth and inflation even in the short-term. It is even questionable how independent the Bank is on decisive matters as the bank bailout of 2008 was clearly a government plan, with Bank officials still delivering speeches about ‘moral hazard’ (pdf). The weakness of his opponents arguments do not by themselves mean that Corbynomics can succeed. But this has been dealt with in a previous post. Instead, it is important to state why Corbynomics is superior to the alternative, based on economic fundamentals. The critics argue that government intervention may have been a necessary evil at the time of the banking crisis (and unsurprisingly acceptable to bankers) but that government intervention in the real economy is unacceptable. This turns economic reality on its head. The returns to productive investment in the economy are far higher than government bond yields. 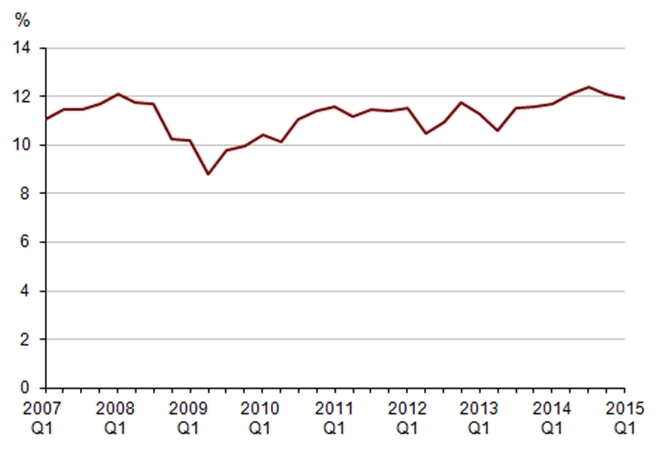 The rate of return for UK companies is currently around 12%, and never fell below 8% even in the depth of the recession as shown in Fig.4 below. 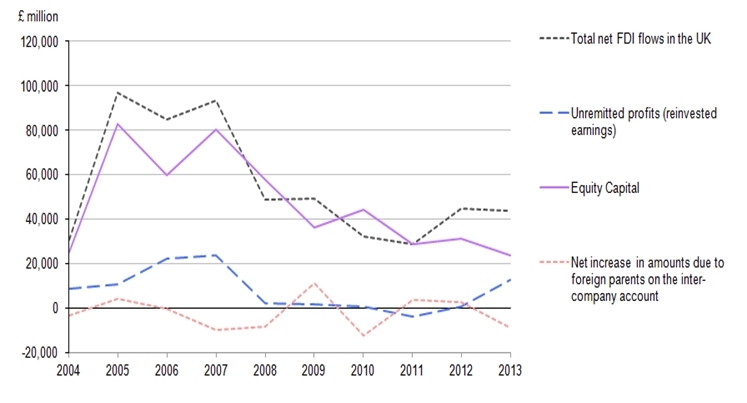 By contrast the British government can borrow at extraordinarily low rates to fund investment, as shown in Fig.5 below. At the time of writing the yield on 10 year UK gilts is 1.8% which is a fraction of the rate of return on private investment. The objection raised at this point (see Peston in particular) is that there are no projects or sectors where such returns are additionally available, otherwise the private sector would be investing in them. But this criticism is misplaced and only serves to highlight the innate superiority of state-led investment over that of the private sector. On exactly the same investment, the returns available to the public sector are higher. To demonstrate this, take the obvious case of housebuilding. Private builders estimate an average construction cost per home of £100,000 in Britain, and a sale price of £175,000 to cover their fees, borrowing costs and of course profits (National Association of Home Builders estimates). Yet government can build exactly the same home at exactly the same price. It will naturally have far lower borrowing costs than any private sector company. But it is the returns to government which are massively higher. This is because government obtains tax revenues which of course are unrecoverable by any private sector developer. This will be both income taxes on all labour employed, plus tax revenues on all consumption financed by that income, and all other consequential taxes. There is also a benefit to government finances from the increase in economic activity arising from lower social security payments. The UK Treasury estimates that for every £1 increase in economic activity there will be a 75p boost to government finances, 50p in tax revenues and 25p in lower social security payments*. As a result the net cost of home construction is just £25,000 (after all returns are included) while it now has an asset with market price of £175,000. Employment and a home have been created and a genuinely affordable rent is easily possible. The superiority of the public sector is even greater in a strategic sense. Government can direct investment to the most-needed or most productive sectors of the economy, energy, transport, infrastructure and education, in addition to housing in a coordinated fashion. The vastly greater returns to the government means that it is not even the main direct beneficiary of the investment. It is private firms who benefit most, at least in a direct sense, from investment in transport, education, infrastructure and so on. But the key condition is that they not be allowed to act as a brake on investment, as they are currently. The trading response of financial operators is entirely predictable. Irrespective of their political views, their purpose is to make money. 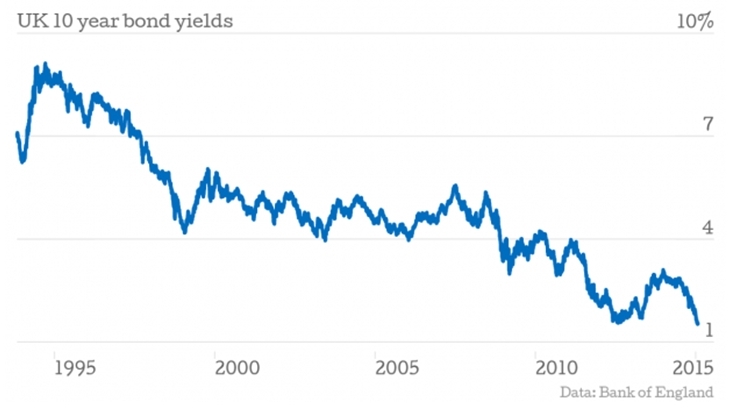 The dire warnings against the 2009 Labour stimulus Budget, that interest rates would soar was actually followed by a sharp fall in interest rates. Investors were more likely to get their money back from a government whose economy was growing rather than contracting. (The political response may be another matter, but that is a separate discussion on the levers a radical government would have to use). Government investment in the productive sectors of the economy yields very high returns, much higher than the interest payable on government debt. Corbynomics has offered a range of options to achieve that increase in investment. All of them are preferable to current policies because they can work. *Treasury Working Paper No.5, Public Finances and the Cycle http://webarchive.nationalarchives.gov.uk/20100407010852/http://www.hm-treasury.gov.uk/prebud_pbr08_publicfinances.htm The author is grateful to the office of Caroline Lucas MP who managed to locate this paper. It seemed to have been buried away under the Coalition government. This entry was posted in Austerity, Economics, Government policy and tagged austerity, Corbynomics by adminthinkleft. Bookmark the permalink. Credit debt creation out of thin air by private banks is the method used to transfer wealth to the elite, and undermine democracy. Banks get ALL the interest paid on credit creation savers are not needed! More debt more money for bankers. who ever controls money supply controls the country .You lot really need to WAKE UP! Debt cannot be paid off with money created from debt, stop credit creation by private banks, allow only the BOE to create money and all repayments and interest go back to the BOE. Private banks just get commission for selling money, like a retail shop. NATIONALISE our £.